On Friday, November 30th in Issue 47 Volume 28 of The San Pedro Sun, we reported that the price of regular gasoline dropped to the lowest price of the year. Now, there has been another decrease in fuel prices, reducing the consumer cost for all four types of fuel sold across Belize. 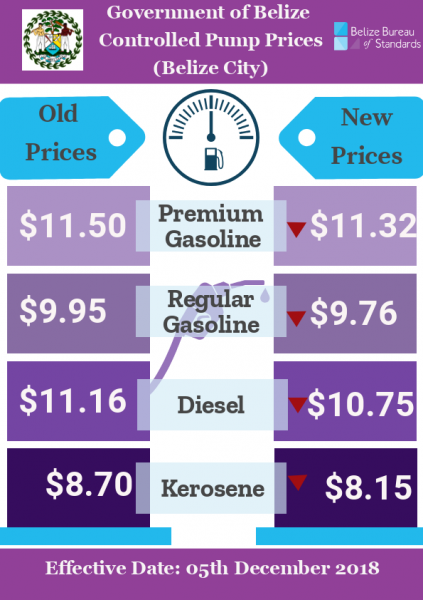 According to the Belize Bureau of Standers (BBS), effective Wednesday, December 5th the price of premium gasoline went down by $0.18 to $11.32, regular gasoline went down by $0.19 to $9.76, diesel went down $0.41 to $10.75, and kerosene went down by $0.55 to $8.15. With these new fuel prices, Belizeans are seeing the largest reduction for 2018. The unsteady fuel price throughout the year has left Belizean unsettled. Many argue as to why fuel prices in Belize are exorbitantly high as compared to other countries. Prime Minister Dean Barrow had indicated that Government of Belize has little control over the price of fuel in the country as international fuel costs dictate it. During a press conference on June 19, 2018, he explained that “countries like Russia agree in principle to increase production of fuel and U.S. sales are going great. So it does look like for the next few months, perhaps the next half of the year, there ought to be a downward trend.” But that price reduction did not come until the last month of the year and residents are left wondering what the price of fuel will be in the coming year. The San Pedro Sun reminds island residents that the stated prices will be reflected at mainland pumps only, as the price for fuel on the cayes is relatively higher due to barging costs.